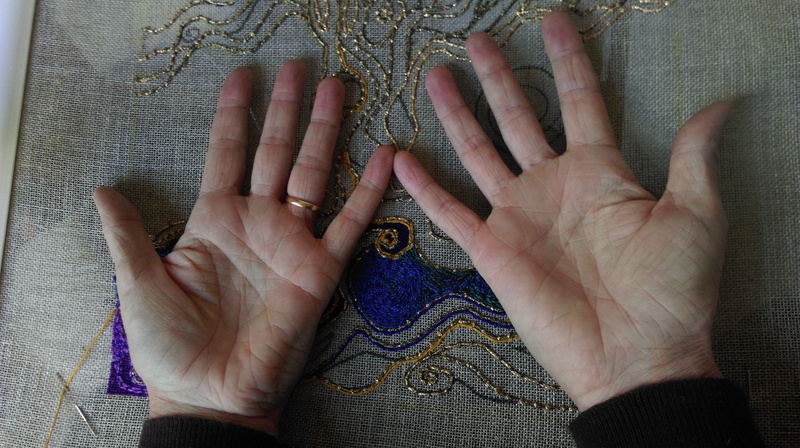 It just happens that the same woman is an obsessive stitcher (yes, it’s me – you guessed). So she decided – not for the first time – to grow one in stitches. She didn’t know exactly what it was going to look like, but she had an idea – a touch of awen– which she sketched onto the canvas. A riot of colours were swooshing around in her mind, and eventually she chose the ones she was going to use. It was autumn and lots of things were happening in her life, but gradually, stitch by tiny stitch, the tree began to appear. She took the initial lines and gradually elaborated on them with the threads, letting her imagination decide where to take them. 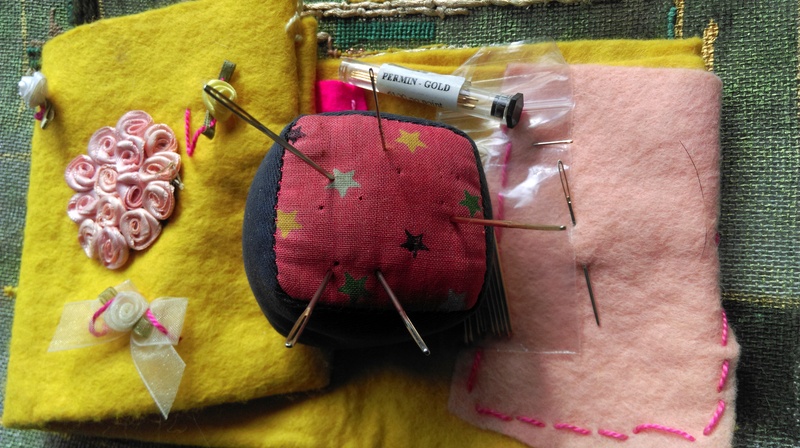 Sometimes, when there were dark days, the repetitive, meditative process of stitching took her mind away from problems and sadness, and gave her peaceful, mindful moments. 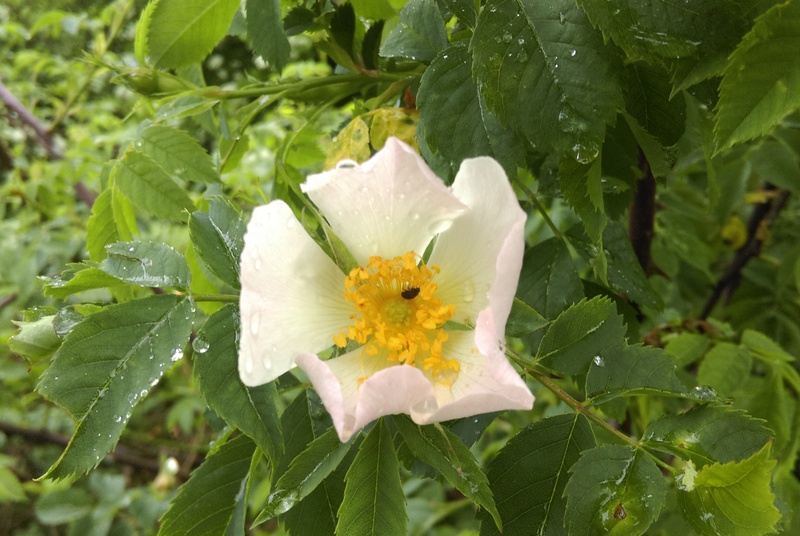 And all the time the tree continued to grow – watered just a few times with her tears. But there was a lot of happiness too. 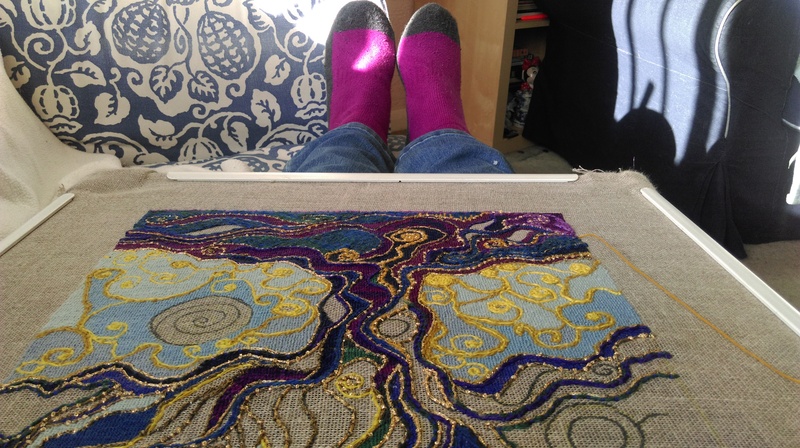 She thoroughly revelled in cosying up on the sofa when it was cold outside, thick woolly socks on her feet, listening to the radio or TV while on she stitched. Time passed, Christmas came and a new year began. 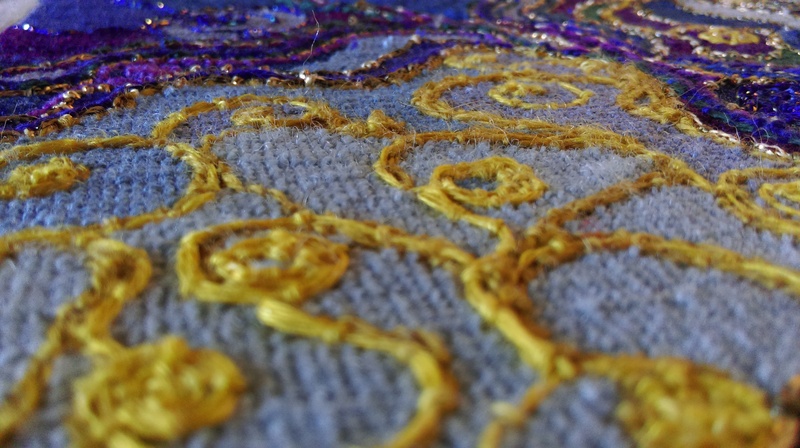 And all the unknown spaces, all the blank areas on the initial design, were filled with silk, wool and metallic threads. Nearly the end of January and I hope everyone is now getting back into some sort of ‘normal’ routine. (Oh yes, I can hear the cackles from here…). Around here, things have been going quite well. 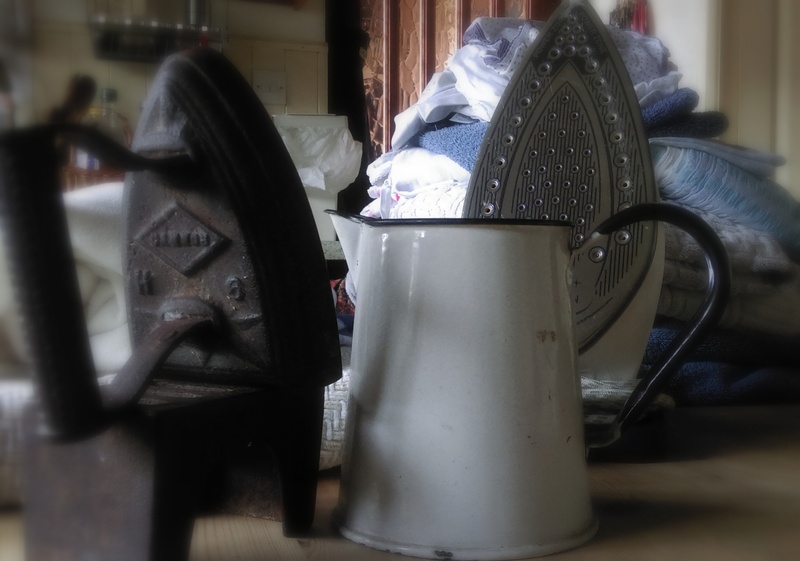 I’ve somehow managed to get back into a semblance of a domestic rhythm – which is not something the feminist in me would ever have expected to write – but still, there’s no escaping the fact that for me at least I function better and get more creative work done when the boring bits are under control. But I eased myself in gently. A visit to the V & A at the beginning of the month to see the Fabric of India exhibition, was a great way to get the creative juices flowing. I’ve decided that 2016 will have more Artist Dates* – it’s too easy to get caught up on the hamster wheel of daily life and we need to step off and recharge from time to time. Fired up by the trip to London I’ve managed to get back to stitching properly this month. Unusually for me, I started the month with two pieces in progress. 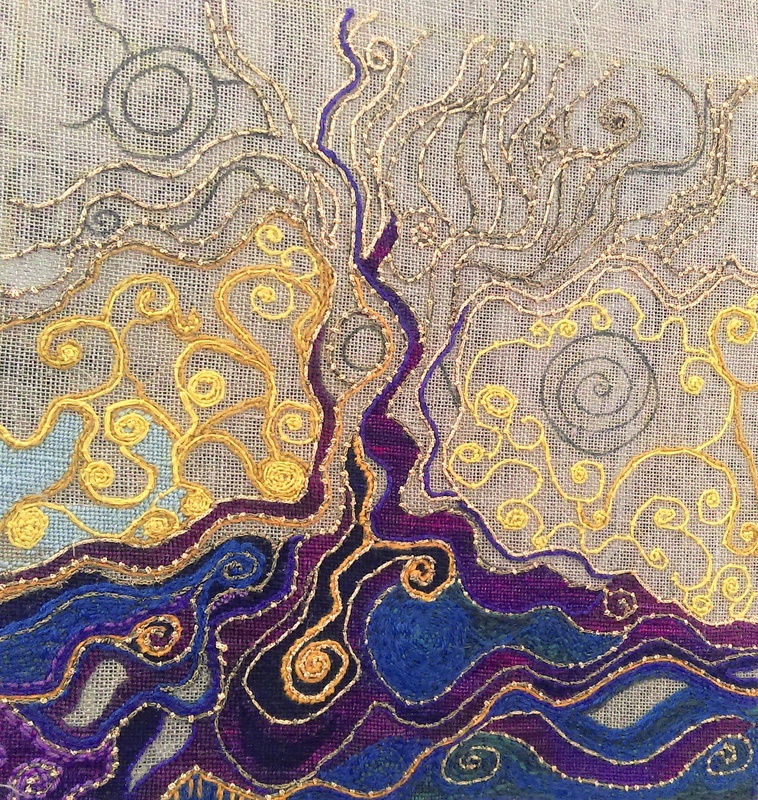 The first is an experiment with a different style of stitching, inspired by a summer’s day on a Scottish beach. 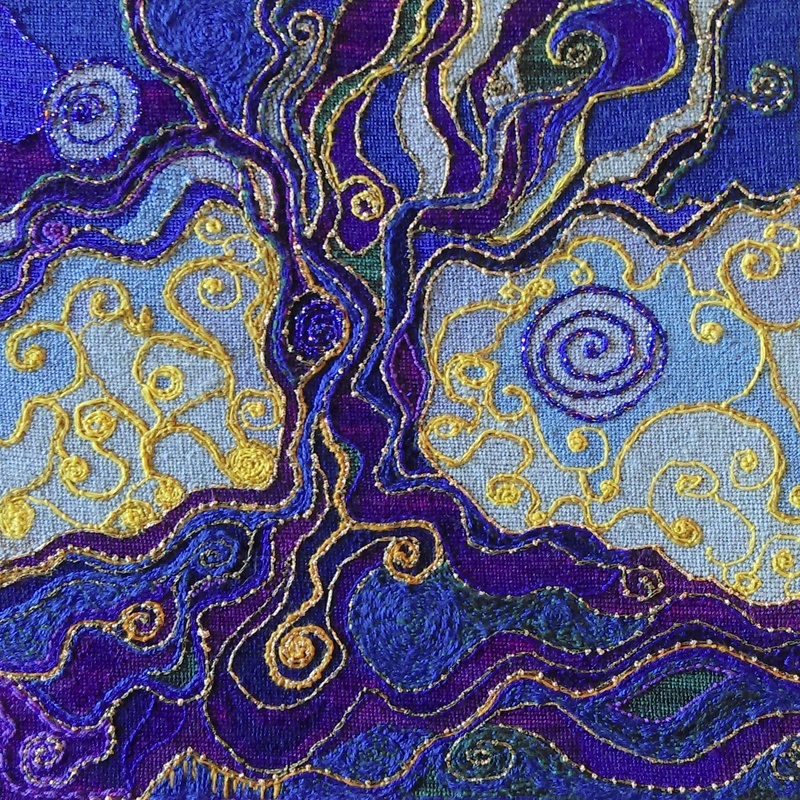 I remember sitting on the beach (at Sango Bay to be precise), looking out at the sea and sky and realising that there were distinct bands of colour running horizontally and suddenly thinking that it might make a good subject for a stitchy piece. I didn’t have the phone with me, so instead, I scribbled notes about the different colour bands in a little book I was carrying, and hoped it would be enough description to enable me to interpret it when I came home. When things were a bit rough before Christmas, I started putting this idea together, and I think having a completely different, ‘see-how-it-goes’ approach made it easier to pick up when I felt able. I am much more ‘at home’ creating tree pictures, especially if they contain lots of spirals. While I’ve been curled up, stitching away at this latest specimen, I’ve been thinking more deeply about this addiction to trees. I thought that if I could go back and collect up all the drawings, pictures and doodles I’ve ever done, I’d hazard a guess that well over half would have featured trees. I have no idea where this all started, but I know I was already doing it when I went to secondary school. 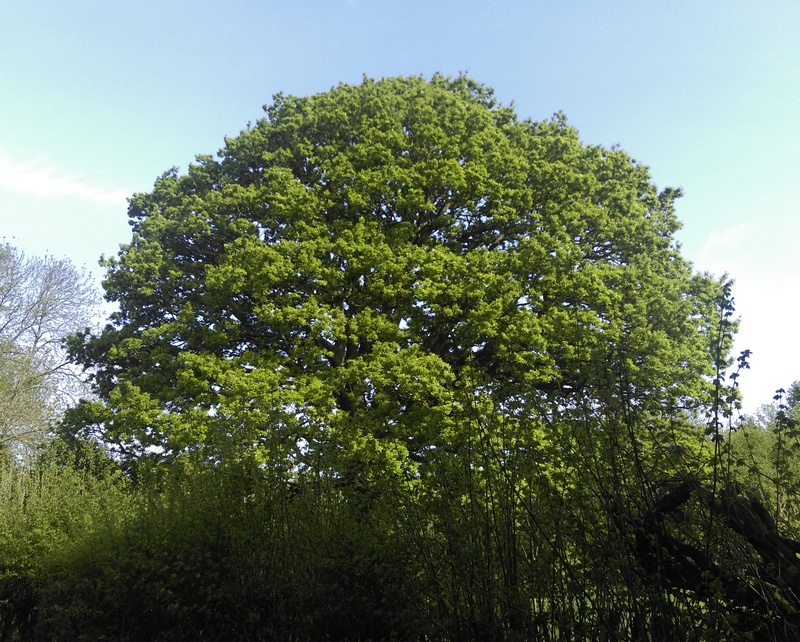 My Instagram feed is full of tree pictures – my own and those of the many other people out there who also share this fascination. 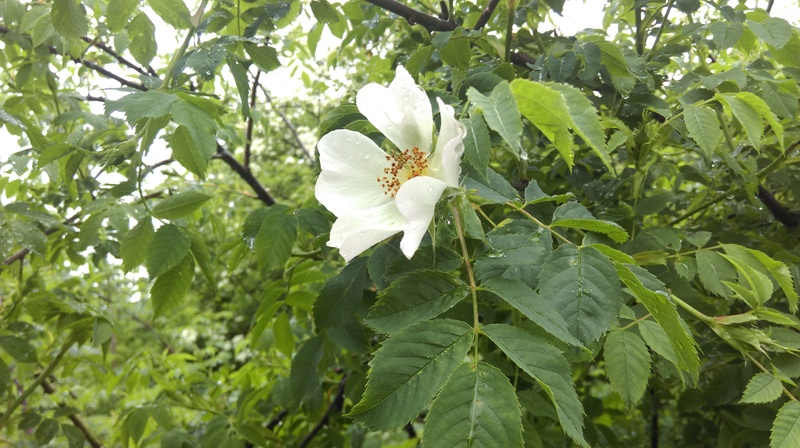 Last week I met another lady, also an embroiderer, who does exactly the same thing and takes a daily picture of a favourite tree – it’s a small world. You don’t have to be obsessed with trees for long before you become engaged in exploring the mythology surrounding them. I had originally thought I might write about that in particular, for instance the Tree of Life, Yggdrasil, Druid oak groves, that sort of thing – but it’s such a huge topic, these are just Western mythologies, and trees feature in the mythos and cosmology of cultures all around the world – I wouldn’t know where to begin or end. 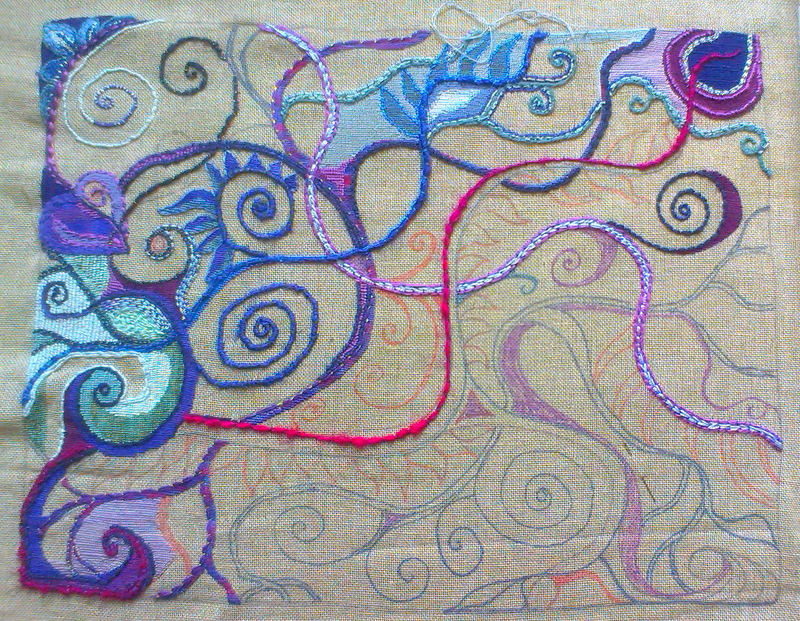 And I shall carry on with this one and wish you all happy stitching! 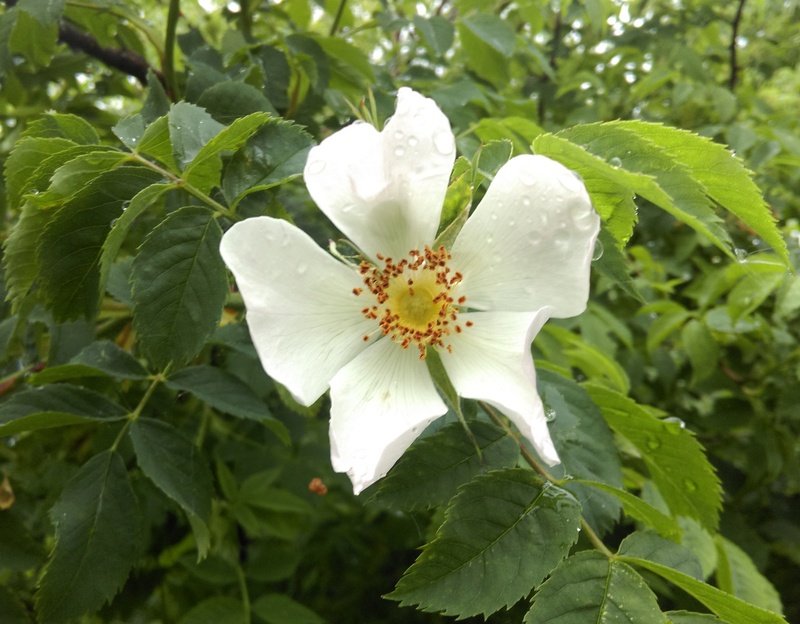 * Artist Dates: Julia Cameron’s suggestion in The Artist’s Way that artists should have a weekly ‘Artist’s Date’ to charge their creative batteries. A few weeks back, when the Discover Original Art group was discussing our upcoming exhibition in November, it was suggested that we each share online, details about the tools and materials we use to make our art. 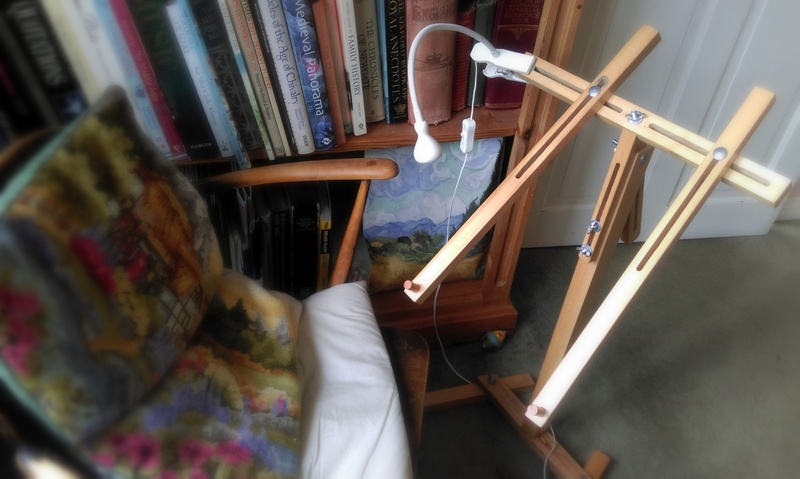 I loved this idea, because there’s nothing I like better than having a nose about other artists’ studios, seeing what they use to create their work: imagine the fascinating tools used by printers, glass makers, stone carvers, oil painters, mixed-media artists, eco-printers! 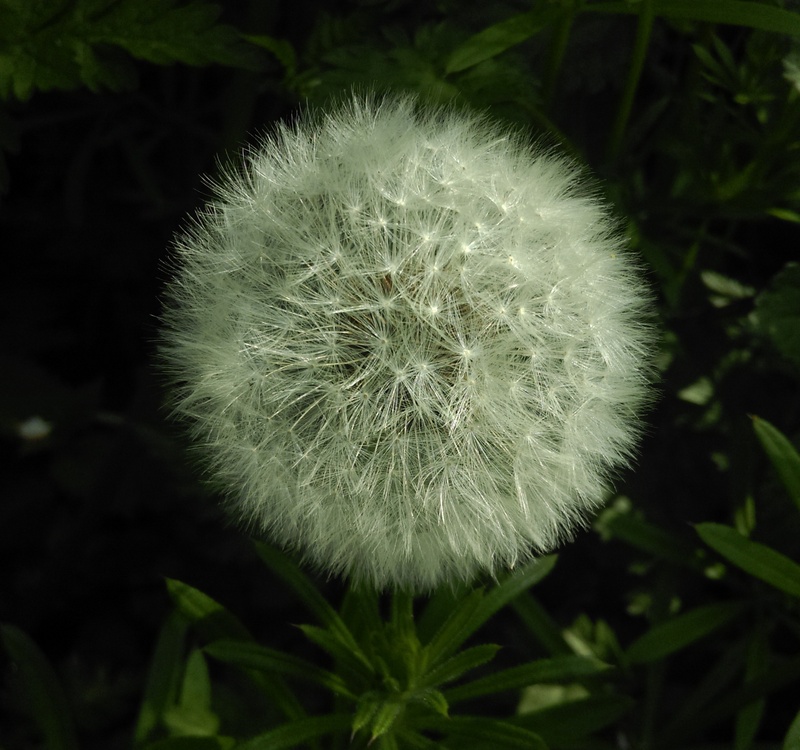 But then, there is surely beauty of a kind, in the simple, the mundane? It took me a long time to realise just how much difference using the right size for the job would make – duh! I would like to hug the person who invented the R & R Craft Frames – for me, the number one choice every time… which is not to say I don’t occasionally use others, but well, the flexibility of the R & R suits my stitching style. I thought it would be a fun thing to describe a typical* day in my arty life. I don’t write Morning Pages, but for me, the daily walk with the Delinquent Dog is a form of meditation and the time when I clear my mind. 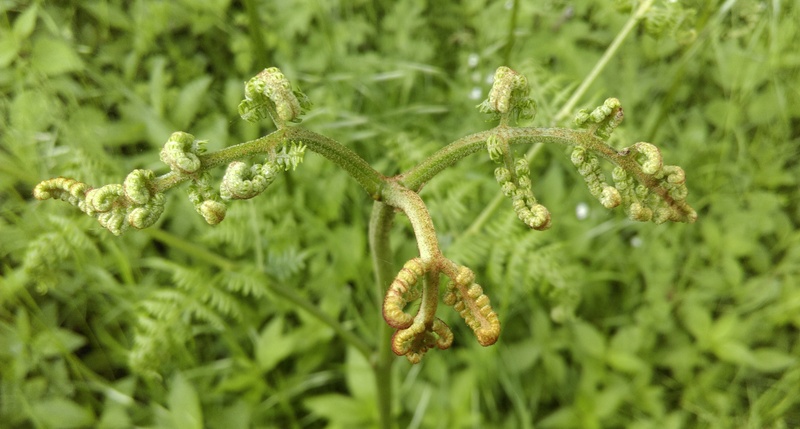 We take the same route every day, which is a wonderful way to tune-in to the changing seasons, watching subtle changes and feeling the immediate connection with the weather. It’s simultaneously grounding and relaxing. 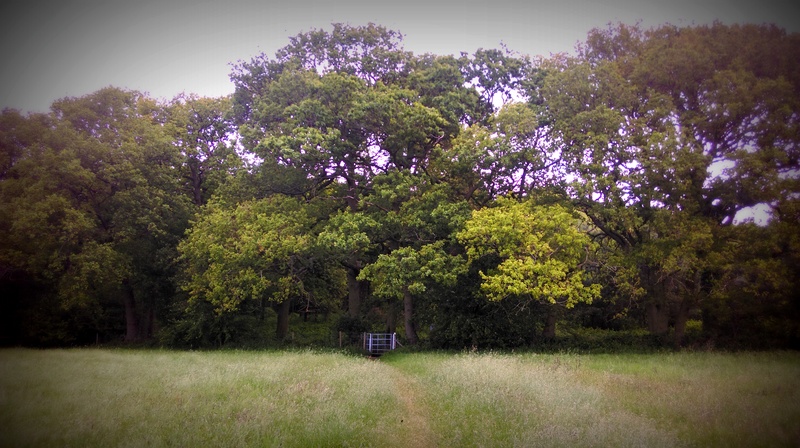 Followers on Instagram may remember that I photographed the same oak every day last year, an exercise that taught me much more than just how an oak changes through the seasons. I pause most mornings at my Thinking Gate – sometimes I am actually thinking when I lean on the gate, sometimes I’m just listening, just being. I’m not consciously looking for inspiration on those walks, but I’m sure something seeps into my unconscious which probably finds expression in my work. My trusty accomplices are the Mac, my Filofaxes, my pencil and my smart phone (with which I take all my photos – I don’t own a camera). 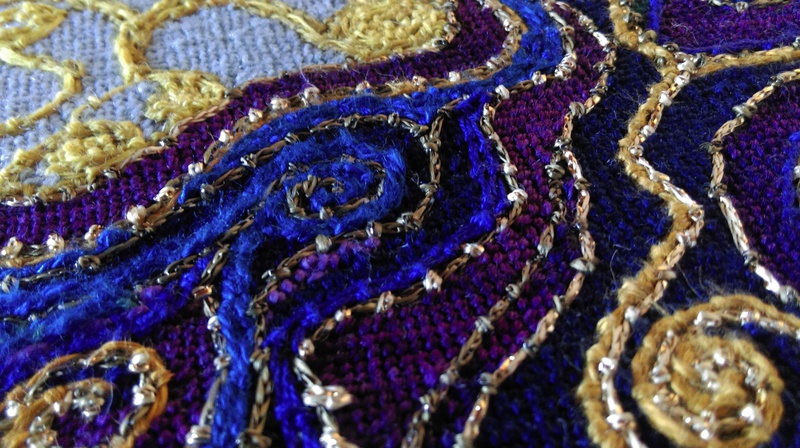 Stitching is wonderfully meditative. It isn’t long before I’ve drifted off somewhere in my mind. Most of my work is only lightly planned, with the details coming as I go along. 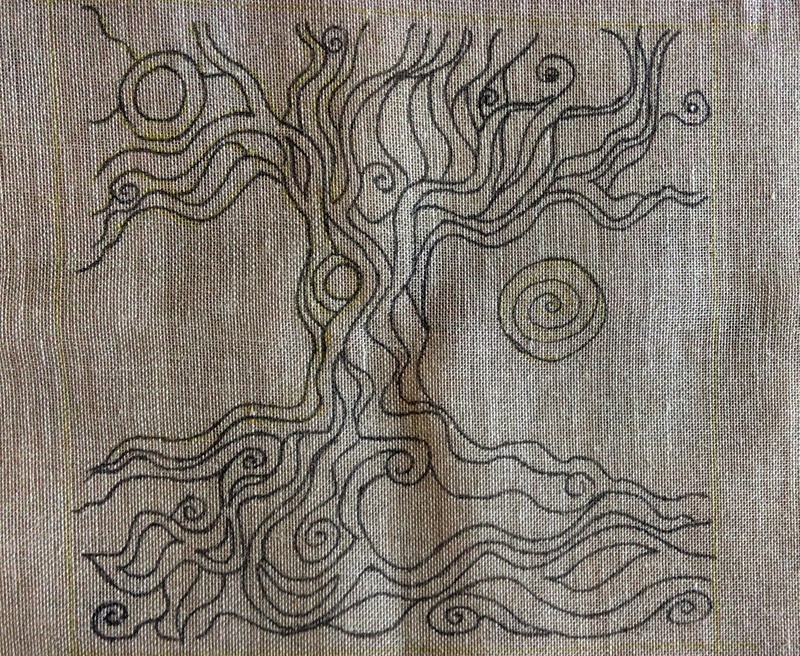 If you’re familiar with the Druidic concept of Awen, that’s very much how I feel about inspiration and connection, which for me expresses itself in my stitching. I’m fuelled by coffee, strong and black, which I take a break for, every couple of hours or so. Once the family are home again, I slip back into the domestic routine. Working from home can make it difficult to separate work from home life, and I used to suffer a lot from feeling resentful at having to keep stopping to change roles, but gradually, I’ve found the balance that works for me, and now I try to give myself entirely to family matters until after dinner, when usually I’ll have time to relax with my stitching buddy and embroider for a couple more hours. * Obviously there’s really no such thing as a typical day – just typical elements, but you know what we mean. ** Morning Pages, as many of you know, is part of Julia Cameron’s Artist Way. Although I don’t do them now, I did do something very similar a couple of years ago and found it extremely helpful. I had the great pleasure of visiting Fibre East last weekend at Ampthill, Bedfordshire – happily for me, very close to home. Not usually the sort of person who enjoys big events, I was persuaded to go by the lovely lady at Art Van Go, who mentioned it in passing to me, the last time I was over in Knebworth. We had been discussing the difficulty of finding the range of yarns we wanted locally and the demise of shops selling any worthwhile selection of tapestry threads. And so off I went to Ampthill, armed with high hopes and a fairly bulging purse. What a brilliant day I had! I was delighted to find that Fibre East was big enough to have a fabulous choice of suppliers, but not so huge that you couldn’t get up close and personal with the yarns and have a good talk with the stall-holders. 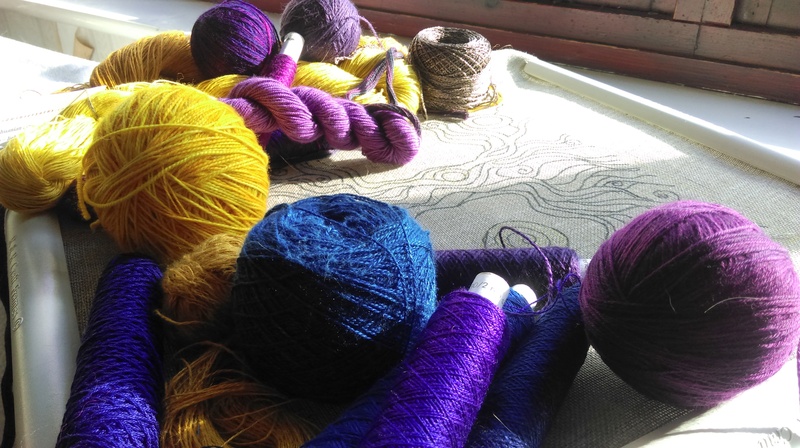 For me, one of the most fabulous things about becoming serious about textile art, has been discovering a whole new group of people, many artisans or very small business owners, who are producing an amazing range of threads. Access to such a variety of colours and textures is what has transformed my version of needlepoint/embroidery to the art practice it is, so I was enormously pleased to see so much variety available from people who all seemed to be passionate about their products. It was also a pleasure to be able to touch and test out so many silks, wools, cottons and linens. Most of my purchases are made online these days, and although this works well enough, there’s nothing quite like being able to stroke the threads, and see for yourself their true colours. One of my main objectives, was to identify suppliers that I could go back to online, throughout the year, knowing that they had yarns, strong enough for me to use for my canvas embroideries. Of course, there were far more goodies than my purse could cope with, and so feeling a little like the woman who goes to the rescue home for dogs and wishes she could bring them all home with her, I had the horrible job of deciding which ones to bring away with me. 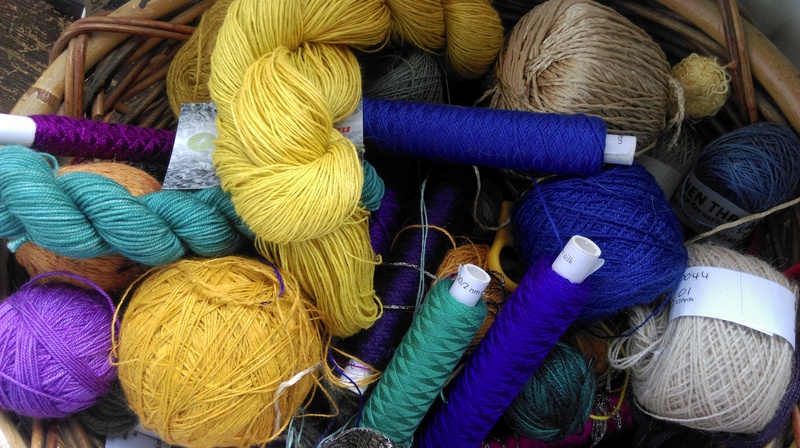 There were many I left behind – I know there were lots of other kind-hearts/yarn-junkies, doing their own bit to re-home the entire stock, so not too guilty! And I have noted a number of people who although I didn’t buy from at Ampthill, I expect to go back to at some point. 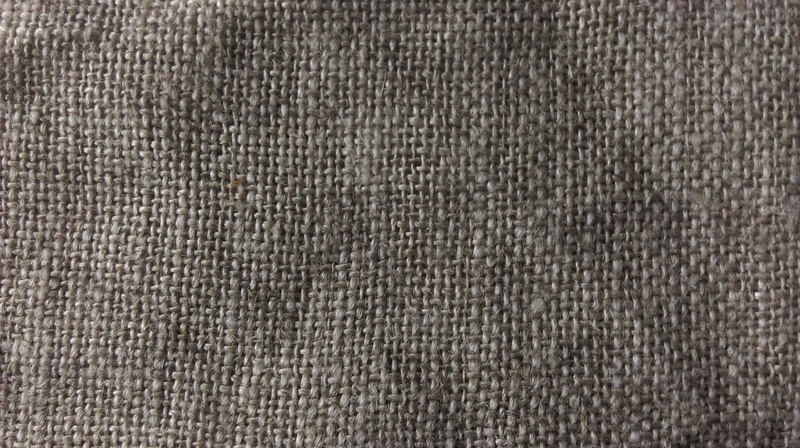 Black Bat – http://www.blackbat.co.uk – Exquisite natural woollen yarns – the lace weight Wensleydale works wonderfully as a tapestry thread! Midwinter Yarns – http://www.midwinteryarns.com I went a bit goo-goo over the coloured linens. Whimzy – http://www.whimsy.co.uk – Irresistible colours and the lovely Ling! Hardwick Hall is in the care of the National Trust, which considering the nature of the building and its fragile and delicate contents, is probably a very good thing. But the downside of showing so many historic tapestries, embroideries and needleworks, is that they keep the light-levels very low to avoid light damage. So if you have the chance to visit on a day when it isn’t raining – grab it. 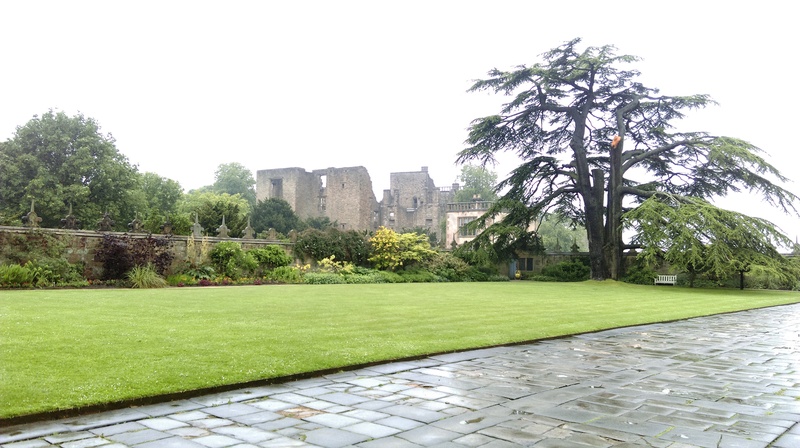 View from the New Hall to the ruins of the Old Hall (also largely rebuilt by Bess) and a ‘must’ when you visit the New Hall. 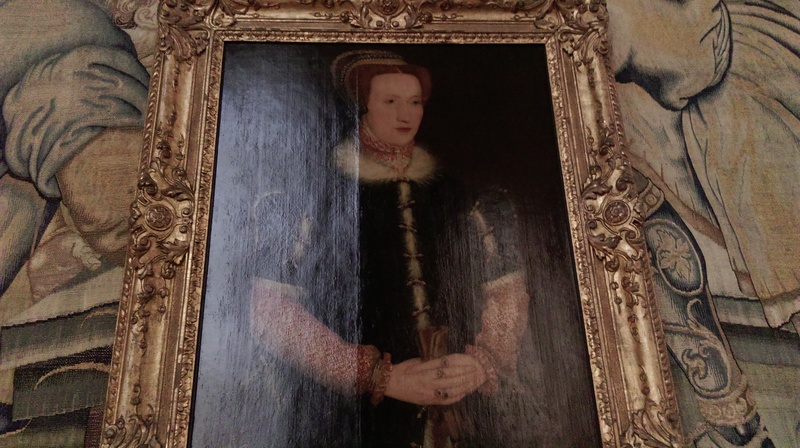 Anyway, I’m sure many of you know all about Bess of Hardwick (if you don’t, read about her here, or better still, read this book: Bess of Hardwick: First Lady of Chatsworth – Mary S. Lovell). If Bess’s wasn’t exactly a ‘rags to riches’ story, it wasn’t far off. 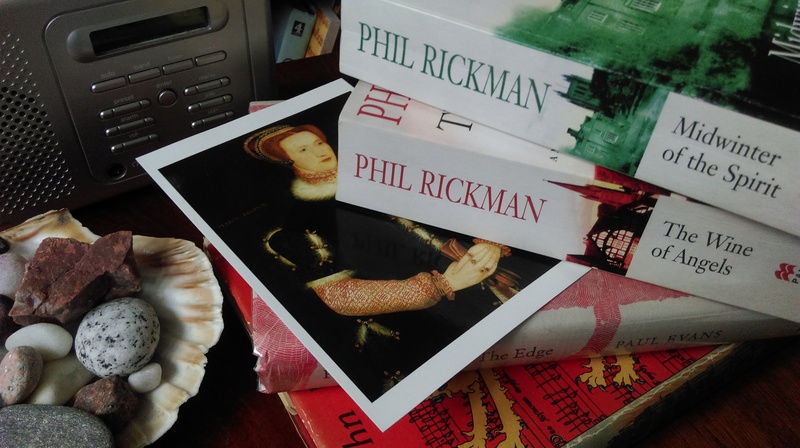 Honestly, I don’t understand why dramatists aren’t all over her story – married 4 times to wealthier and wealthier men, life at the court of Elizabeth I, sharing her home with Mary Queen of Scots, arranging marriages for a brood of children, building at least 3 magnificent houses, acrimonious divorce, deaths – her story has the lot! And the best bit – Bess wasn’t some pawn in the game, she was a lead player. Time and again, Bess confronted difficult situations and worked at them to the advantage of herself and her family. She is for me, an incredible example of a strong woman, standing up for what she wanted and what she thought was right and at a time when this was certainly not the norm for women. Luckily, much of her correspondence and her inventories remain, so it’s possible to read her own words, which make her feel extraordinarily real. She comes across as something of a cross between an extremely powerful business woman and your Grandmother – juggling the stresses and strains of a major business empire with the day-to-day upheavals of a complex and sometimes dysfunctional family life. 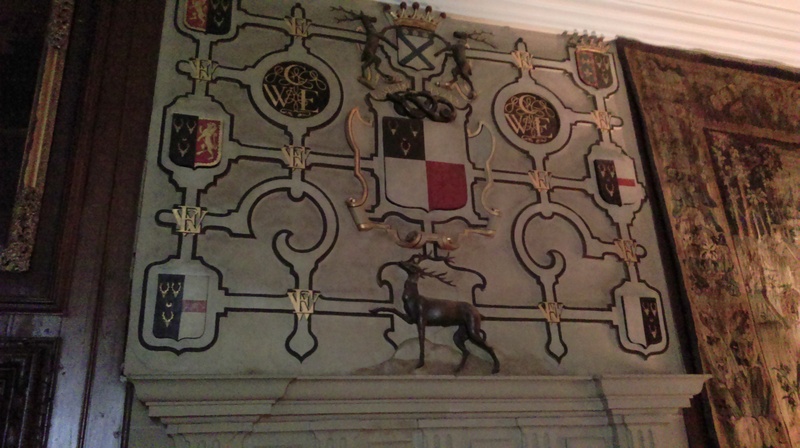 The marriages of Bess’s children, celebrated in a heraldic mantel. I’m not sure that she would have been all that easy to live with, or to work for, but of all the people in history I’d love the chance to go back and talk to, it would be Bess – she is my all-time historic hero. But of course there’s another reason why I love her so much. Bess was into textiles. Her homes were adorned with every kind of rich tapestry, needlework and embroideries money could buy. 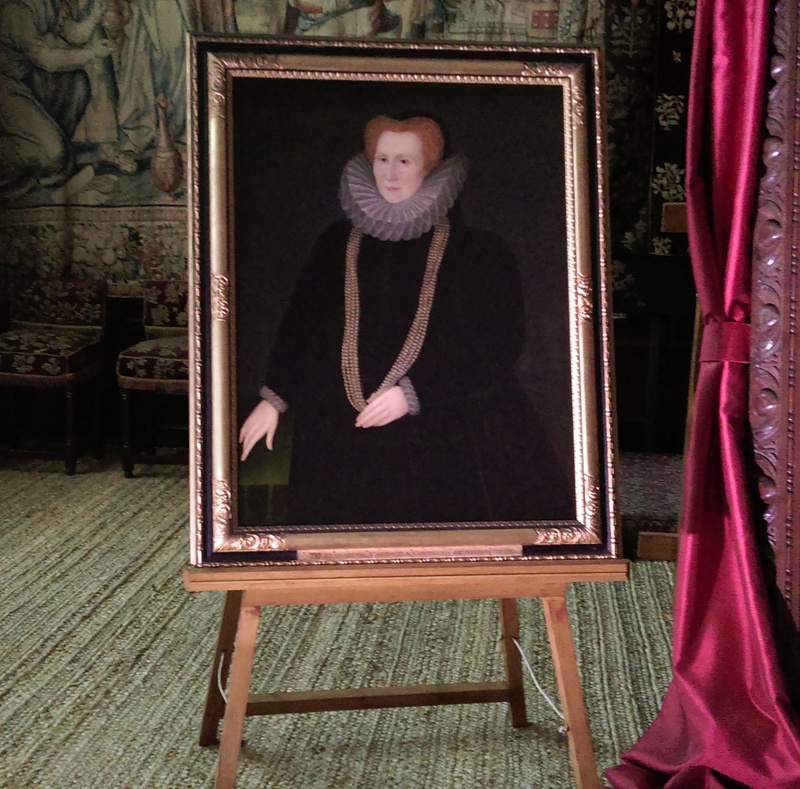 And although much was produced by professional embroiderers, she also stitched some pieces herself – which gives me a kind of thrill when I look at the many textiles at Hardwick and imagine her running her hands over them, or even wielding her needle. 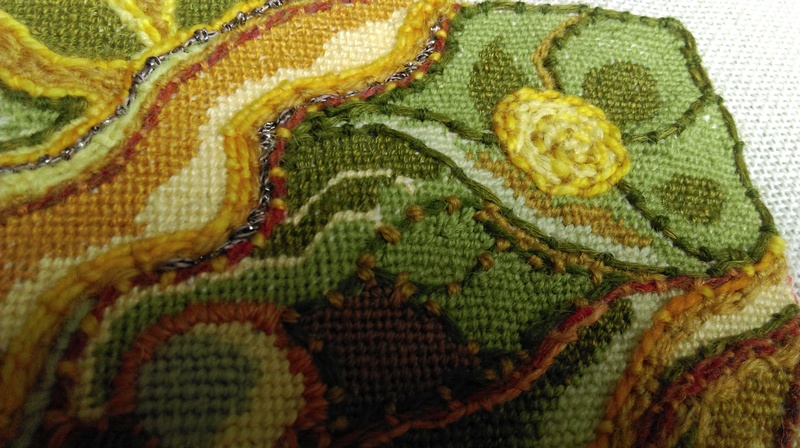 Details from a long cushion – Fancie of a Fowler – velvet with applied needlework motifs. I stood for a long time, working out in my mind how some of these pieces were worked. And I suppose it’s seeing something made over 400 years ago, using techniques exactly the same as the ones I use today, that gives me a special thrill. Occasionally, you find yourself understanding precisely why they chose to work in a particular way, and in that moment, there’s a connection across those 400 years. You stand there and realise that if the embroiderer was standing next to you, you’d be talking the same language. The building itself is superb, but in a way, it overwhelms me, which is why I usually find myself looking for the odd or the quirky aspects, such as the staggered windows and the worn stone stairs. It’s the sort of house that will speak in different ways to every visitor, I’m quite sure. Certainly on Saturday afternoon, it was proving awesome to many of the visitors – which is really quite some legacy, even after all these years. Visitor information from the National Trust is here. 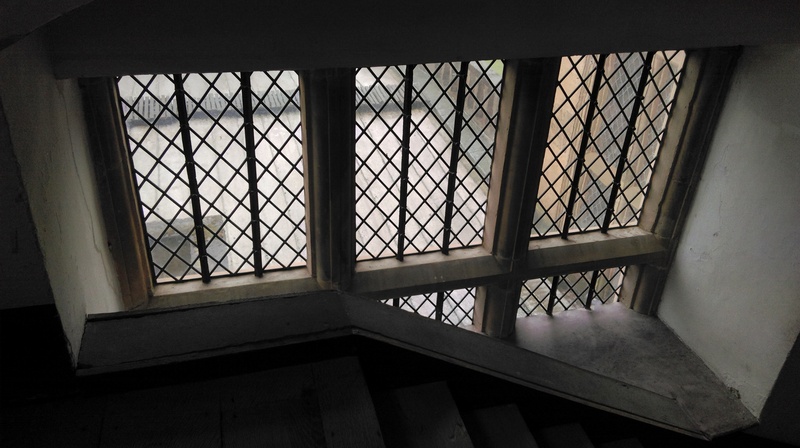 For a wonderful and fascinating insider’s story, follow Ellen Scarlett’s delightful and informative blog – View From My Attic – Ellen works at Hardwick Hall and gives fabulous glimpses into the life of the Hall. Do visit Hardwick if you can, you’ll be very glad you did. My mind seems to have been all over the place lately. 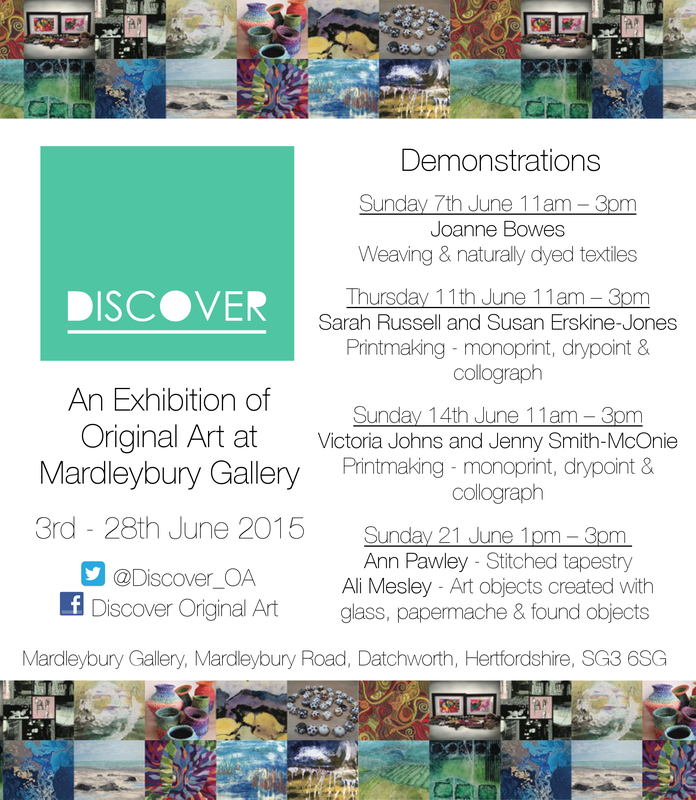 I’ve been preparing for the Discover Original Art exhibition – more over at my website (click here for gallery details) – which starts on Wednesday this week, 3rd June. I’m so pleased to have had this date to work towards, because although at times I felt as if things weren’t ever going to come together, knowing that I had to get there, eventually worked its way into my subconscious and turned things around. 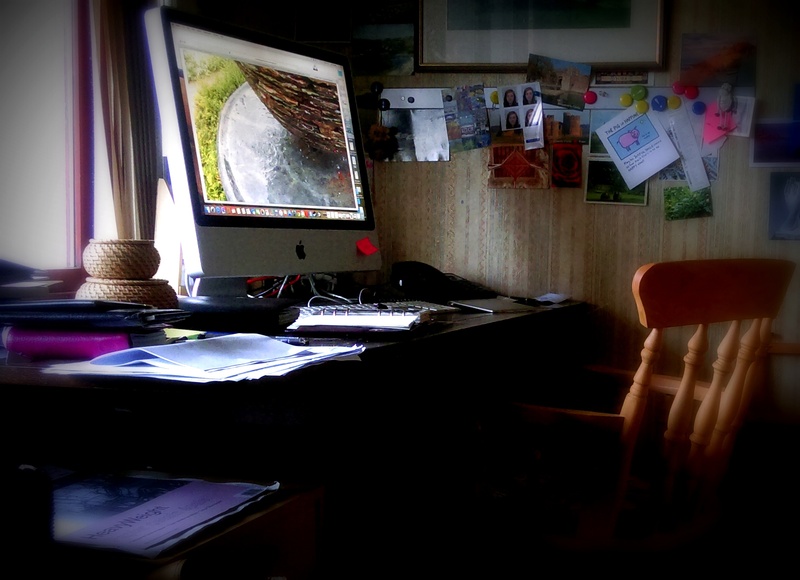 This last 12 months has seen the most amazing upheaval in my approach to making art. 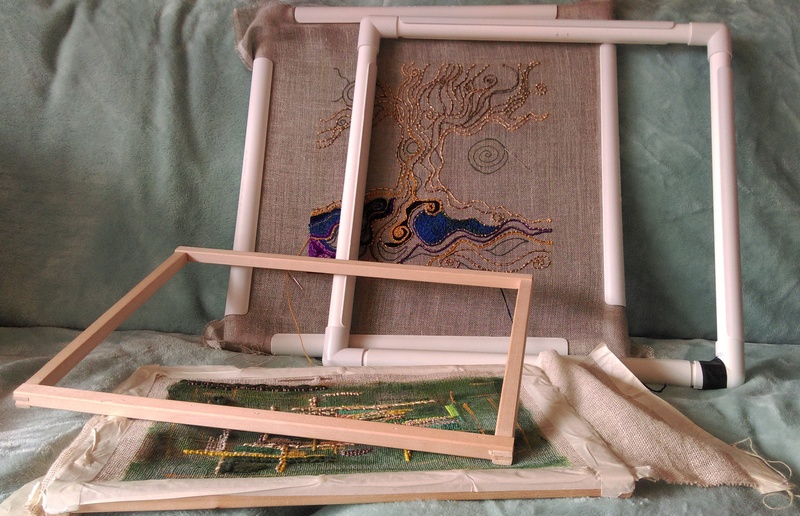 Twelve months ago, I had a stack of stitched canvasses sitting on a shelf, with no one except immediate family and you, my lovely blog readers, ever seeing any of them. Now, less than a year later, I’ve met and joined a local community of wonderful artists and begun to find my voice in the real, as well as the virtual world. In a very literal way, I’m beginning to feel as if various threads in my life are now coming together. A year ago, I wouldn’t have dared think of myself as an artist. Now, well, it doesn’t feel too far-fetched. So having dates to work towards helps remind me that this is real, and at last there’s the freedom to make art without feeling guilty, which for me, is the most amazing gift imaginable. 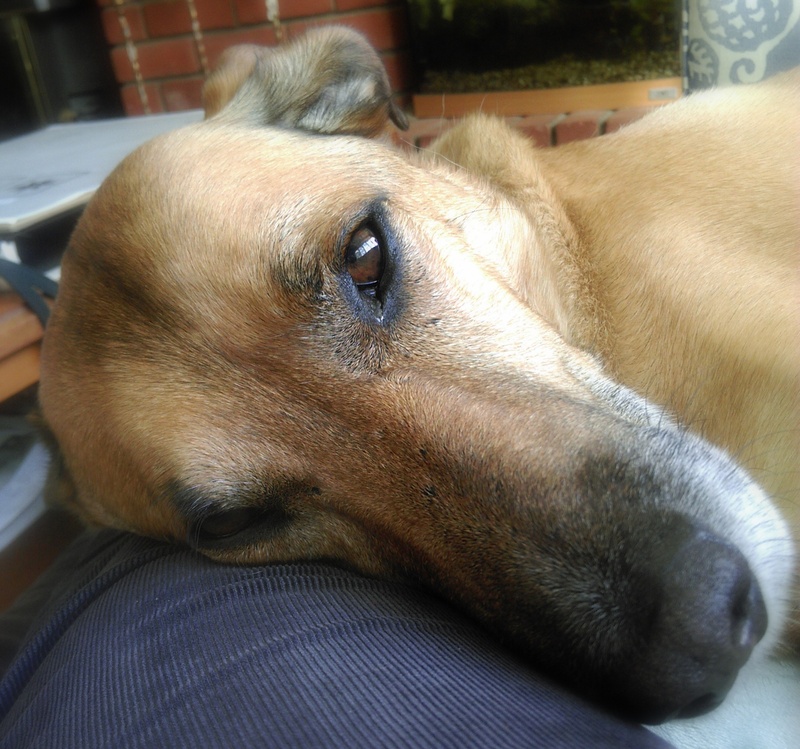 Keeping my head together though, with home, family and art to juggle, is helped enormously by the daily routine of walking the Delinquent Dog. I just don’t seem to be able to get away from greens at the moment. I suppose that this year, even more than usual, I’ve been tuned-in to greens, having been working with a green palette for quite a few weeks. 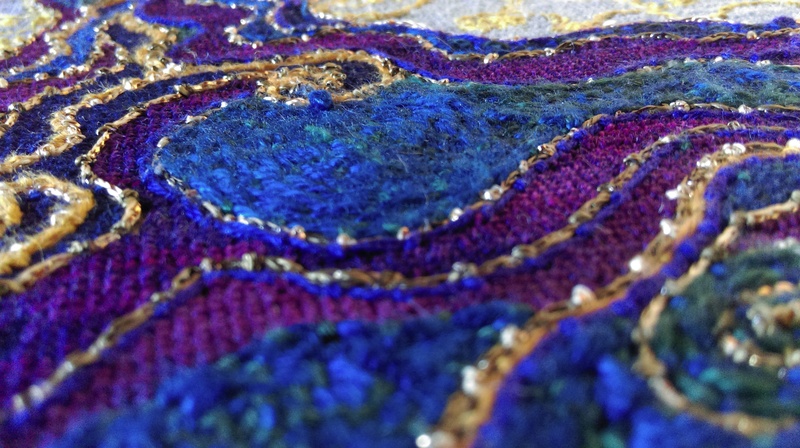 Embroidery – well the way that I do it – is an extremely slow art form, and all those hours of stitching, inevitably lead you into a very close relationship with the different shades you’re using. And similarly, the various textures, coarse tweeds, strong wools, fluid silks, all play differently in your hand and in the canvas – all working together in sometimes unexpected ways. Trying to plan what goes where I find to be a fairly pointless exercise. Instead it seems to be better to simply let each thread decide, according to what else is happening around it. 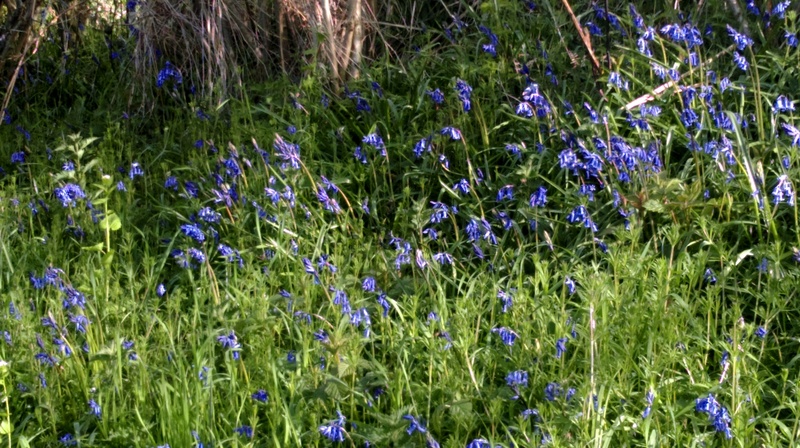 Impossible at this most verdant time of the year, to ignore the way that the countryside changes colour. 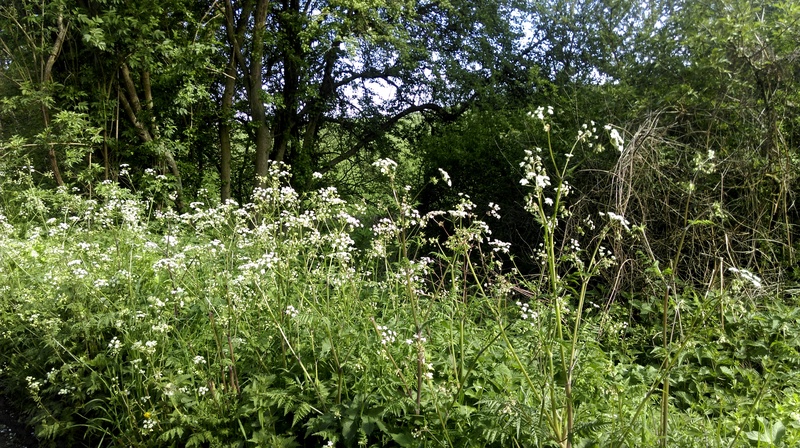 So many delicate plants appearing in the lane every day now, but all held together by nature’s tapestry of green. Do you enjoy personality tests? We’ve all experienced them at one time or another, whether serious ones when applying for jobs (INFJ* if you’re interested), or the marginally less serious ones in personal-development books, online-dating, dieting, and of course the entirely spurious ones in countless magazine features – they crop up all over the place. 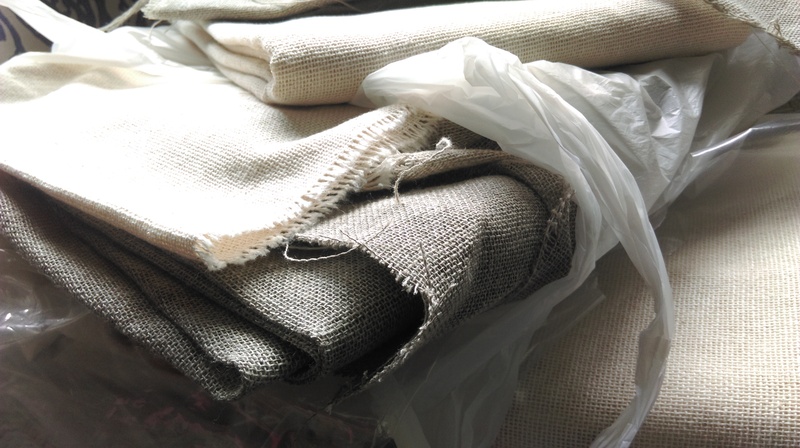 For some reason, when I was fishing through my stash of canvas the other day, I couldn’t help thinking that our preferred choice of canvas might well be an indicator of our personality. Yep, use them all – what does that tell you? If you spend half as much time trawling Blogland as I do, you’ll no doubt have seen a fair number of bloggers lately writing about why they write. I love reading these posts, I suppose we’re all fascinated by what brings us back to the blank screen, time after time. 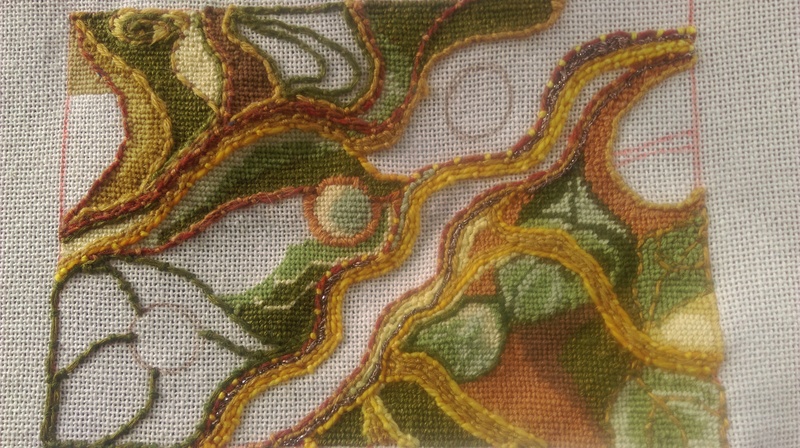 This is what I’m stitching at the moment – well, I would be if I wasn’t also running a part-time taxi service for two teenage daughters, doing daily battle against the invading laundry pile and attempting – frequently in vain – to keep on top of the cooking/shopping/gardening and cleaning. This time I’m going for some gentle texture, so it’s what I’ve taken to calling a canvas embroidery as opposed to the stitched tapestries which are smoother (because they’re all done in tent stitch). How does my stitch differ from others in the genre? Ummm, is there a stitched tapestry/canvas embroidery genre? I’ve never been able to decide if what I do fits into any category, which is probably why I find it difficult to know what to call it. 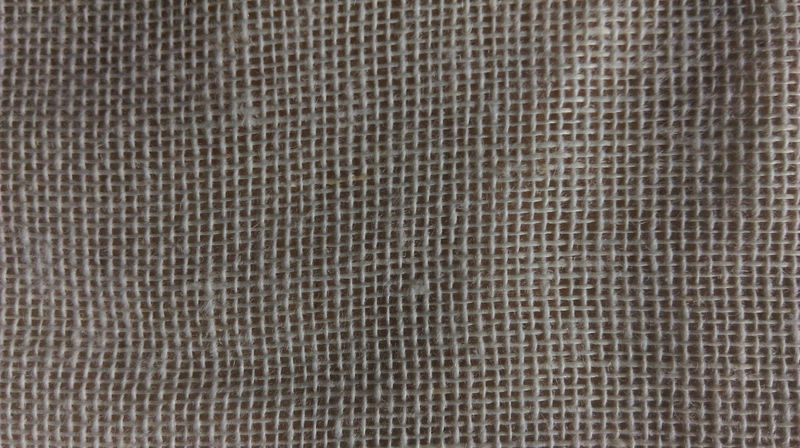 All I can say that I know is perhaps unusual, is that I much prefer to stitch into loose-weave canvas materials rather than the rigid monos and interlocks – it makes for interesting times trying to square anything up, but I like the feel, the weight and the drape of the finished pieces much more than anything I’ve ever done on stiff canvas. 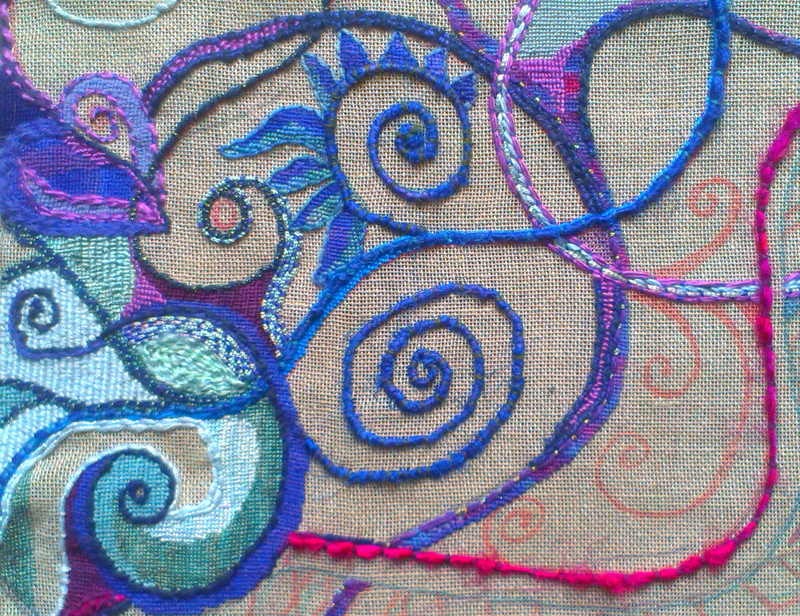 Or perhaps I should say that for me, stitching is just painting in threads. I use wools, silks and cottons as a painter would apply oils, acrylics or watercolours – thread just happens to be the medium in which I’m most at home. 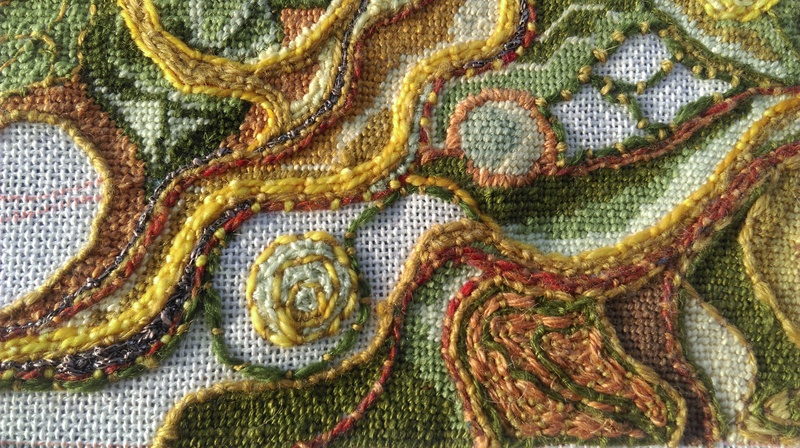 Why do I stitch what I do? I was tempted to answer this ‘I stitch, therefore I am’ (sorry Mr Descartes). I don’t know why I stitch, but I don’t seem to be complete, to feel at one with life the universe and everything unless I have some stitching on the go. It’s just something I’ve done for so many years, it’s integral to who I am. 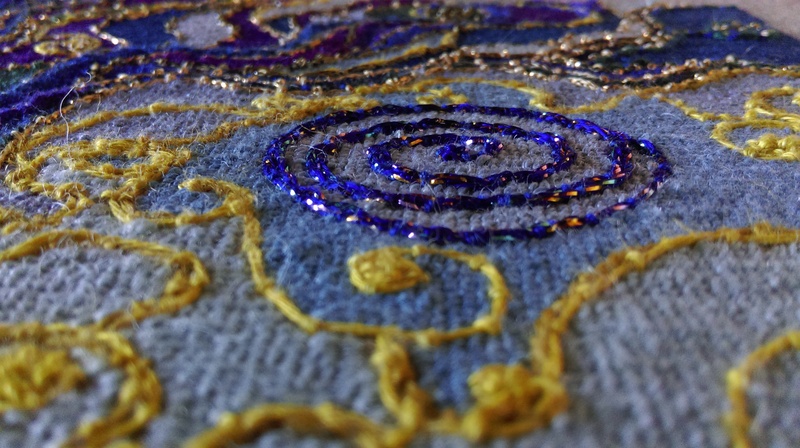 I tell people that I find the process of stitching meditative and that’s true. When I’m repeatedly passing the needle backwards and forwards through the canvas, I find a peace and inner calm. But when you think about it, that’s not surprising because it’s not something you can do quickly, so it forces you to slow down, and then finding the tiny holes literally requires one-pointed focus, both characteristics of meditation techniques. As for subject matter, I always wonder where inspiration comes from. I’ve mentioned before how the druidic concept of awen* appeals very much to me, I like to embrace that idea. And somewhere deep in the machinations of my mind, my love of all things ancient and historic, of medieval arts and crafts, and of the patterns and textures from the natural world, coagulates into the designs that finally end up in the canvas. 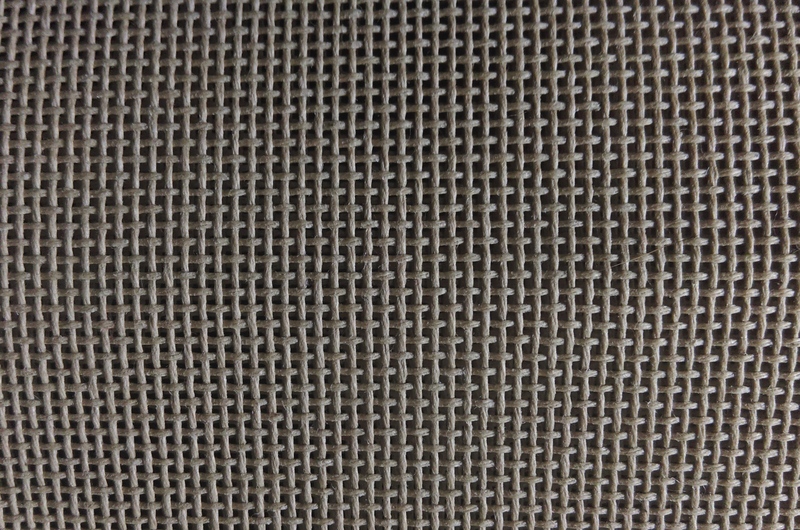 How does my stitching process work? Much easier to answer this. I’ll generally start with something loosely seen in my mind – it might be a combinations of colours or a pattern or something that has kindled an idea. I might try to sketch something on paper – probably getting the paints out too, although I never end up with anything even vaguely akin to the cartoons tapestry weavers may use. I just try to see how it might sit in two dimensions. 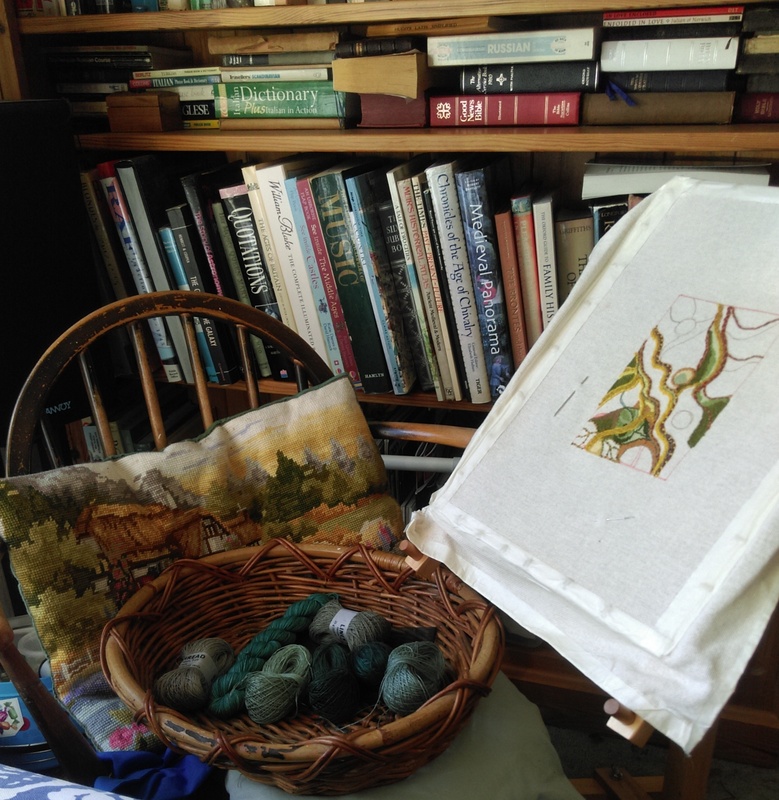 Then I lay out the canvas and draw on a rough guide (one advantage of using loose-weave scrims and crash, is that it’s much cheaper than tapestry canvas, so I’m not afraid to get anything wrong). Then I rifle through my stash of yarns and pull out all the colours and textures I think I’m going to want. (If the project starts with a colour concept, this stage will come before the design). Often I’ll decide I need to add shades, so it’s off to whoever has what I’m looking for – I love that part! And frequently, once I’m into the piece, I’ll decide it needs additional shades, so these are bought in as and when they’re wanted. 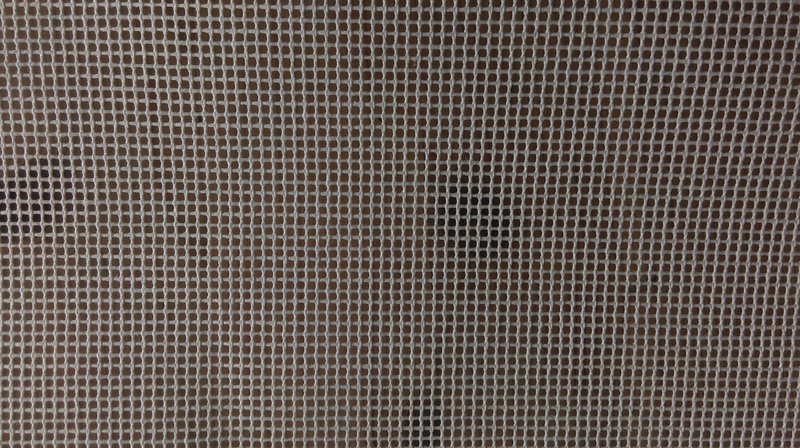 I mainly use a clip-on frame to hold the canvas because I like to be able to move around it – I suppose this is where I really depart from woven projects which have to be created line by line and this is also why I tend to think of it as painting in threads, after all you don’t paint from the top up or visa versa, you go all over the canvas as the piece requires, and this is to some extent how I stitch (this is also how I decide how to fine-tune which colours to use where). And after that, it’s just a case of sitting down and stitching and stitching and stitching until all those little holes are finally filled with threads. * Awen: It’s not an easy concept to sum up in a few words here. 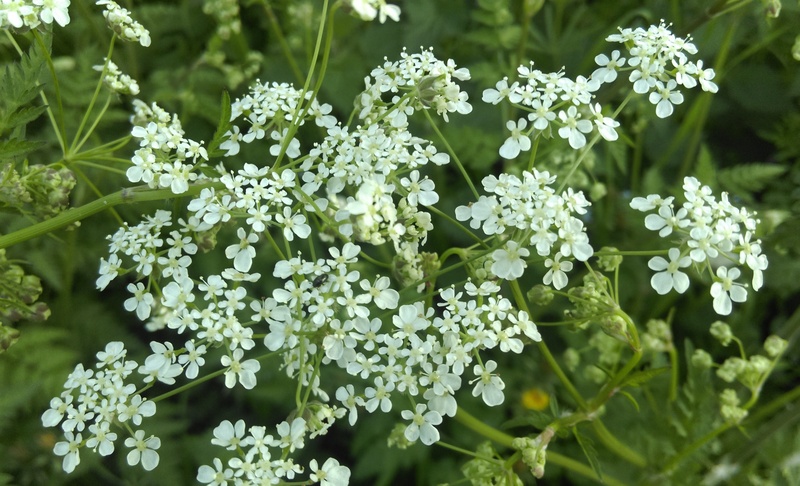 The wiki link is a start, but there are druid bloggers and writers who do a better job – albeit in many more words if you’re interested. 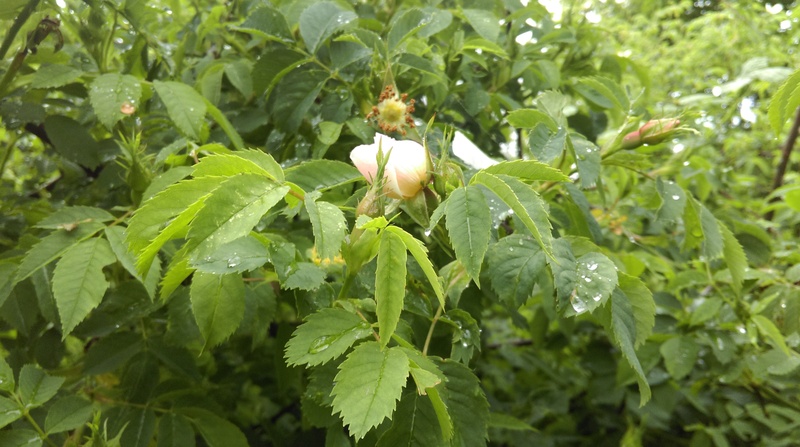 A couple of Why I Write posts I’ve really enjoyed are from Sue at The Quince Tree and Jessica at Rusty Duck. 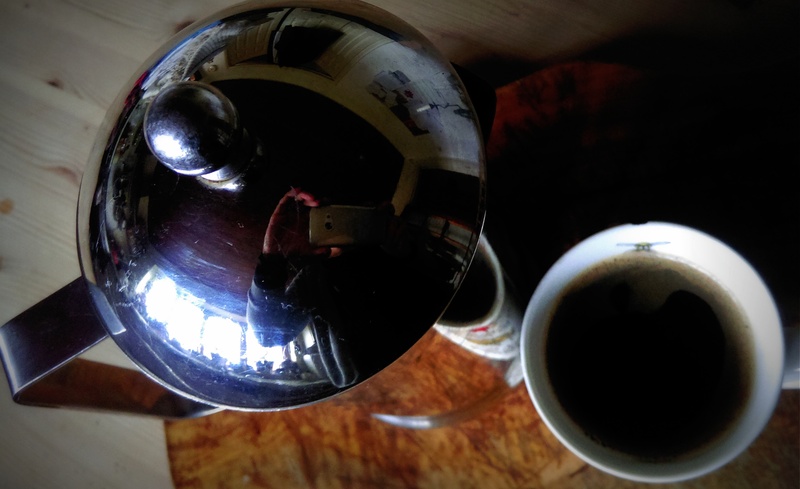 Check out the comments on both these blogs for links to more lovely bloggers’ posts – you’ll need a large mug of your favourite beverage and half and hour at least to while away, but it’s one of the best ways to meet some new Blogland heros. Do continue the hop if you haven’t already, whether it’s why you write or stitch, or, well – whatever makes your heart sing.